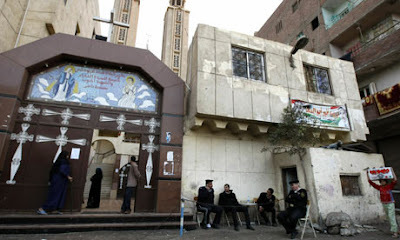 Egyptian police guard the al-Azraa Coptic church in the Shubra district of Cairo as Coptic Christmas starts. Egyptian authorities put up a heavy security cordon today around the main Coptic cathedral in Cairo hours before Christmas Eve mass, using bomb-sniffing dogs, metal detectors and officers to thwart another attack like the New Year's suicide bombing at a church in Alexandria that killed 21 people. Al-Qaida in Iraq had threatened Christians in Iraq and Egypt in the weeks leading up to the holidays, while militant websites have allegedlyposted online lists of churches in Egypt to target. Egypt's Coptic Christian minority, which makes up 10% of the 80 million population, celebrates Christmas tomorrow. Some have said they will avoid Christmas Eve services. Across Egypt, police were stopping vehicles from parking near churches. They also planned to check identity cards of those entering churches and ban worshippers from bringing in bags and purses. Outside the Coptic cathedral in central Cairo, security officers with walkie-talkies patrolled the surrounding streets. In the southern province of Minya, a worker at one church found a small explosive device packed with nails and fireworks planted under the stairs, a security official said, adding that the device appeared designed to "test security measures". Several daily newspapers said the interior ministry has asked church officials to prevent crowds from gathering outside churches after mass. The request appeared aimed at avoiding a repeat of the attack in Alexandria, in which worshippers lingering outside after a midnight service were targeted. Yesterday, the ministry published a picture of an unidentified man whose head was found at the scene of the Alexandria attack. A security official said church officials could not identify the man, but presumed he could be the attacker. But six days after the bombing, Egyptian authorities appear to have made little progress in their investigation. The perceived lack of progress has fanned Christians' fears of repeat attacks. The bombing of the Alexandria church, the worst act of sectarian violence in Egypt in a decade, touched off days of demonstrations and riots by the Christians blaming the government for encouraging discrimination and prejudice and not doing enough to protect them.